Lee ’42 To Be Honored This Weekend in D.C.
Scott Morrison ’14 – Every once in a while an extraordinary story resurfaces from the past. Wabash men for over 100 years have gone into the world to make amazing impacts in both good times and bad. Leslie Lee ’42 found himself on campus in one of the most trying times in human history – World War II. 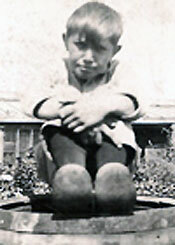 Lee grew up in Indiana on his family farm with four brothers who all attended Wabash and two sisters. After graduation, Lee planned to study plant pathology at Cornell. However, with the war in Europe and the Pacific raging on, he was drafted into the Army and sent to Greenland. The Army trained Lee to be a medical technologist in charge of laboratories. He crossed the beach at Normandy and set up and ran medical laboratories for thousand bed hospitals in Paris and Berlin as they were being liberated. He received a Croix de Guerre from the French government, married his French wife, and returned to the states at the time of the Berlin Airlift in 1948. After the war, Lee went to Illinois where he ran laboratories for a number of doctors and a few hospitals. In 1958 he became lab manager for the Orange Memorial Hospital in Orlando, Florida where he stayed for 21 years. He became president of the Florida Division of the American Society of Medical Technologists and later repaired and wrote Elementary Principles of Instruments which aided in teaching how to use medical instruments. Lee will be flown to Washington, D.C. September 29 as part of the Volusia Honor Air Program. The program’s purpose is to recognize the service of veterans from “the greatest generation.” Almost 60 years after World War II, sometimes we forget those great heroes. The day should serve as a special time for Lee to be honored with fellow military brethren. Leslie Lee is certainly some Little Giant and an exemplar of the Wabash spirit of courage, hard work, and honor. Howard W. Hewitt – Adam Miller’s cross country bike ride is nearing its end. He expects to wrap up the trip or be very close by Oct. 1. You can learn more about both efforts on his website. And you can follow Adam on Twitter. Last week Adam stopped by campus and we talked about his amazing experience. Longtime Habitat for Humanity volunteer Herm Haffner ’77 led students on this WABASH project in Linden, IN in 2008. Steve Charles—As I was making plans to help organize a group for this weekend’s WABASH Day national day of community service, I was reminded of award-winning writer Scott Russell Sanders’ essay “The Uses of Muscle,” published more than a decade ago in Wabash Magazine and reprinted this year in Sanders’ latest collection, Earth Works. Sanders pays tribute to his father, “a brawny, joking, red-haired charmer who often won those contests. Sanders considers how so much of that masculine strength, at least in young men, is channeled into sports, where they “gain some of the benefits offered by hard physical work. Brian Hughes ’11, Vince Okerson ’10, and Seth Young ’11 work on the roof of the Habitat for Humanity project in Linden, Indiana. “The physical power I saw in my father and in the other men I knew while growing up was not for show, not for playing games, but for carrying on the necessary tasks of life. Since fewer and fewer of our households or jobs demand such power, those of us who still inherit the old hormonal rush, acquired by our male ancestors over thousands of generations, may now use our muscles to serve others. 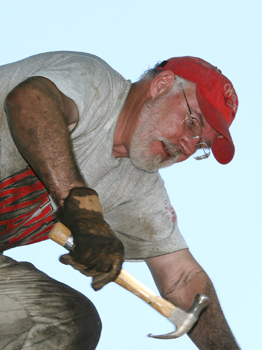 Jon Pactor ’71 didn’t have Sanders’ words in mind when he envisioned WABASH Day eight years ago, but whatever inspired him, I’m sure glad he thought of it. And 11 years after being moved by Sanders words, I’m looking forward to finally putting the camera down for a change and using my muscles for something other than the click of the shutter. Read Scott Russell Sanders’ essay here.